This long desired project is finally finished. Now I can clean-cut metal, plastics or wood stock easily and with minimal loss. I think everyone working on small parts must have one. Some time ago I was working on my cnc lathe and get tired of my options to cut stock, so I decided I needed a mini table saw before continue. Proxxon micro table saw seemed to be exactly what I needed, but I choose to make my own. My start point was a 1/4″ 51x17cm aluminum plate, a 1/15 hp ac/dc 5000 rpm Dayton motor, three proxxon saws, and, of course, the Proxxon micro saw as a reference design. I got three of these motors for $16.00 plus shipping on ebay (well, I order two, but, the seller forgot to ship them at time and kindly add a third). Please don’t ask for motor a source; the original seller isn’t available anymore. 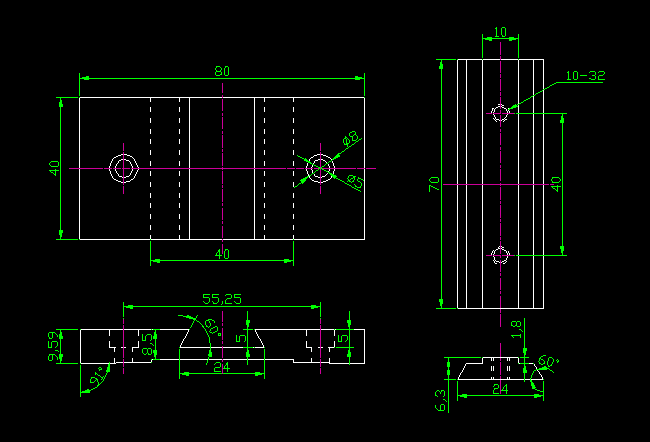 I began designing key elements: the table itself, the motor mount and the saw rotating support. 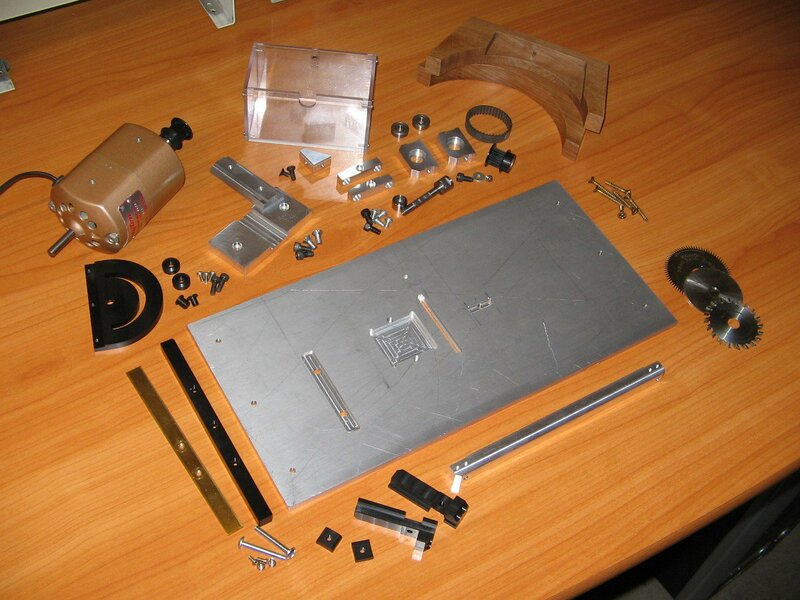 Once I build these parts and put them together I got a functional saw, that help me to build the rest of the parts. One of the tricky steps was to cut the aluminum rectangle to size and square it. As the length was larger than sherline table travel, a two step mill and hand filing was required. Fence was made of delrin and aluminum, and has two locking screws. Assembly allow some degree of adjusting so delrin guides slides without play over aluminum. 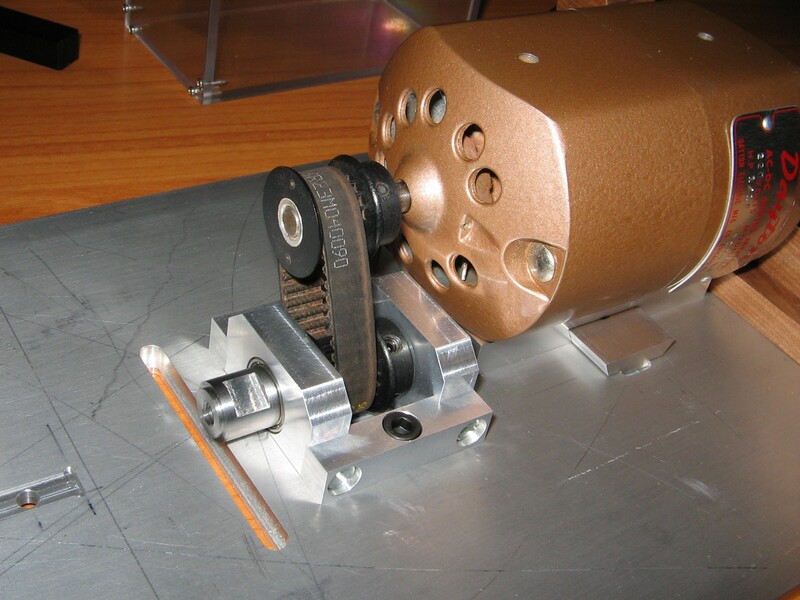 Angle guide was made of delrin and a 1.5×12 mm brass bar. Tough at first I thought that was really unnecessary, it’s a must to cut bars. A dust receptacle it’s a must, as without it you get a mess of chips lying around. I build this using 3mm policarbonate (Lexan) sheet and 1.6m screws. Table support was made using hard some wood I salvaged from an old stepladder. Tough you can make thumb screws on the lathe, I choose to buy them on ebay. I got a bunch of 30 (three types) for $5,74 plus shipping from a Uk seller. They are nice. tough it uses a 1/10 hp motor while mine is only 1/15 hp, and I can cut 6.5mm aluminum (more than four times proxxon capacity). Maybe it has to do with lack in rigidity or something else. There was a lot of work in designing and building this tool, but was worth, and now is one of the main tools in my shop. And it seems to have better cutting capacities (an precision, I guess) than the Proxxon one. Draft drawings are available if someone is interested. 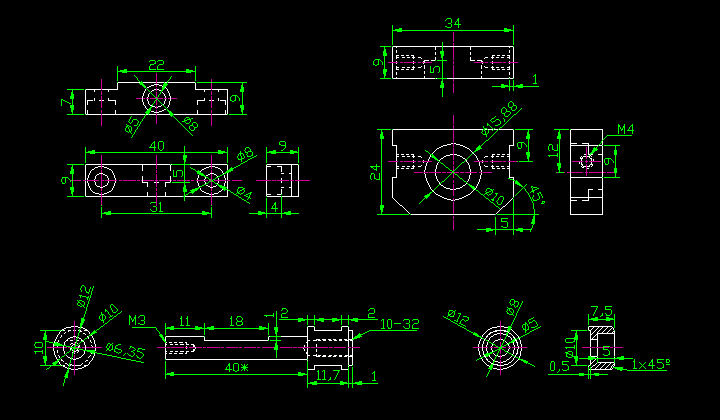 Here are the drawings for the main parts. Please note that these are not detailed building instructions. ; no tolerances, no part lists, etc. I use R4 bearings: 1/4×5/8x.196 (metric 6.35×15.875×4.98). Bearings, bearing housings and spindle must fit without or very little play. Thread-locking fluid may be used in bearing housings if any play. Spindle axis length should be some less than nominal (40*) to reduce axial play (this was a trial-error to me). Pulley set screws must use thread-locking fluid. Without this, screws may get loose (this happened to me, not a nice experience). The motor mounting block was designed to fit a specific motor. I think the angle guide system can be enhaced by cutting a guide with a T profile (4th pic, below). A dovetailed guide would be even better. A thicker table (let’s say, 3/8) would be another enhacement. Great project! Do you think adding vibration isolators might help cut down on the potential instability of the saw with the gigantic motor and all on it? Love the post though! The motor it’s rather small (1/15 hp) and actually vibration i’ts not an issue, but it’s not bad idea to add some rubber between the motor and the mount; may be it helps to reduce noise. I will try that someday, thanks. Nice looking table saw! Good size for my little home shop. Are you able to share your plans/drawings with me? Sure. I will clean the drawings and publish them in a few days. Thanks for the drawings. I’ll save them up for the next project. It seems an incredible table. After seeing the work have encouraged me to do one (certainly not the same, but something similar). It would be possible were to put the motor data? Model, features, etc … The photos do not appreciate the motor data and would like to find one similar. Gracias por tu comentario, es agradable poder responder en mi idioma nativo. El motor que estoy utilizando es un Dayton AC/DC 220v, modelo 9M284, de potencia 1/15 hp y de 5000 rpm. Si no me equivoco es del tipo utilizados en maquinas de coser (si buscas “sewing machine motor” en ebay apareceran unos similares). Como mencione en el post, seria deseable algo mas de potencia, aunque depende claro de tus necesidades especificas. Hi. I’m Muharrem from Antalya / Turkey. I like your job. It must be useful and easy to produce. Thank you for detailed information. I also made some project as a hobby and uploaded on you tube below. Please visit this adresses below. I hope you will enjoy. Hello! Nice work. 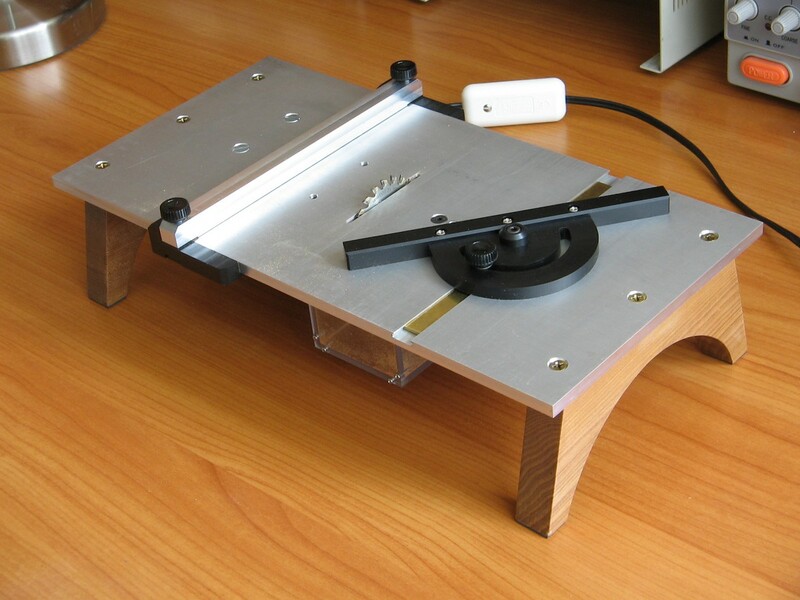 I am starting building my own mini table saw, following your plans, and hoping for almost the same result  . By the way, my name is Alex and I am from Romania. Best regards! I am pleased to hear it. Hope you finish and enjoy your saw. Good luck! Hi. Can you make a bunch of more specific pictures of the spindle, i just want to see how you made the fastening system for the disc (i saw in the pictures that there is a screw that is holding the disc – i want to understand how) and at the other end, how you keep it in place. I want to know that you do when let`s say the belt snaps. How do you change it. I hope you can help me with these details. Best regards, Alexandru! 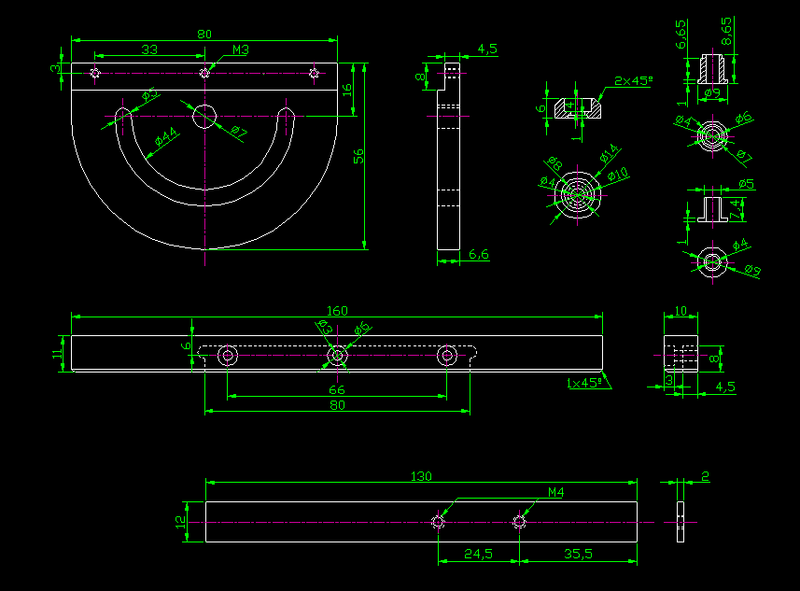 The fifth drawing shows the spindle and retaining part, but if it’s not clear I will upload some pics soon. There’s nothing special about it. Regarding to the belt, I don’t think it will even snap, but dissasembling the whole structure is the only way to take out the belt. The only issue I have found was set screw getting loose on the spindle sprocket, but this was solved using retaining compound. Hope this helps. – Are you planning to offer this Table Saw as a kit ? – Are you planning to sell ready-to-use Table saw ? Please reply me in details. Thank you ! Thanks for your interest. I would like to offer a kit by mid-year, as I plan to start a small business this year. I like the idea of selling kits with the main parts, and leaving the user to finish the details. Sir, good day ! Many thanks for attention with reply. Please keep me informed about project development (progress). Thank you ! Areyou still offering the plans for this saw? I tried to get them for this post and they do not copy well. 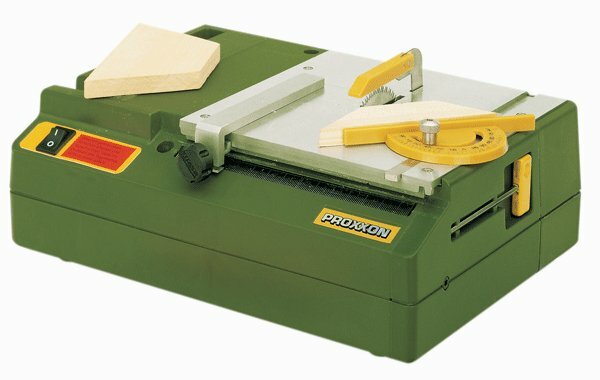 I have been looking for a mini saw for the past few months and would rather try to build my own as to buy one. Buenos días, soy Javier desde España. Me permito escribirte en castellano, ya que veo que te es agradable contestar en tu lengua materna. Primero felicitarte por el gran trabajo que has hecho con la mesa, tanto en el aspecto de diseño como en la fabricación. La calidad es muy buena. Estoy pensando en construirme una mesa para mis hobbies, y no me queda muy claro como has hecho el sistema de guía de ángulos. Mi duda viene en la unión de la guía con la media rueda de ángulos. Que tipo de tornillo has usado para unirlos? Y otra pregunta es por el mecanismo de fijación del ángulo seleccionado. Muchas gracias y de nuevo enhorabuena por tus trabajos. Javier: los tornillos que utilice en la guia fueron socket allen, aunque como puede apreciarse en los planos estos van montados dentro de monturas especiales. En cuanto a la fijacion del angulo, ya que no tiene graduacion el angulo debe fijarse utilizando un transportador o un angulo de referencia. El tornillo que traba el angulo viene con la manilla incorporada y es del tipo “thumb screw”. Espero esto sea de utilidad. very intersting project. Please inform me when you will mini saw starter Kit avaiable. Sir, good day ! Please inform about project development (progress). Thank you ! 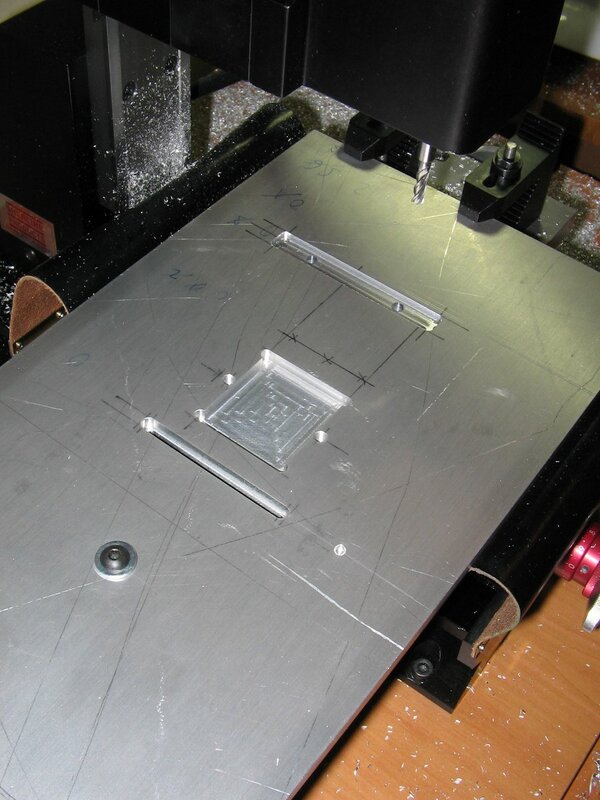 very cool project is it perfect for hobbyists. when i saw the photos i couldnt see motor details may be writing 1/2 hp. you wrote 1/10 hp but it seems quite low i think. could you write again motor details? Motor specs are Dayton AC/DC 1/15 HP 5000 RPM 220 VAC. If it’s low or not it depends of what and how fast you intend to cut. I admit I would like a bit more of power, but keep in mind this is very small, precise and portable saw (I have a big band saw for thick material). Excellent work!, Thanks for sharing, it’s very kind of you. Regards and my respects from Puerto Rico. Gracias anticipadas y mis respetos para usted desde PR. Dr. José. Tal como respondi a Carlos me gustaria cubrir todas las posibilidades. En cuanto al costo eso es algo que aun no puedo aventurar, pero la idea es que sea asequible. Me gusto la table saw pero quisiera saber si puedo optener algunas partes que me faltan con tigo.por ejemplo las partes pequenas de aluminio y pastica. Hi metalAddict, I would be very interested in the kit whenever available. Nice looking saw. Can you tell me what material did you use in making the spindle. Hi. I did use 12L14 steel, for no other reason than it’s easier to machine. Excelente diseño, me interesaría adquirir un kits, claro tomando en cuenta el costo de ese kits como lo comentaste, de tal forma que fuera accesible. I have received news that your are ready to supply all of interesants with necessary parts for building this excelent micro-saw at the moment. Kindly asking you supply me with all possible proposals in details. Thank you ! Sorry but there’s no kit at this moment. As my last post states I’m actually working on enabling cnc capabilities that would allow me, amongst other things, to make kits to sell. I hope to sell a kit within 6 to 12 months ahead, but there’s no official date. excelente trabajo! Estoy a la espera del anhelado kit. That’ s a fabulous table saw! Seems perfect for cutting PCBs also! I encourage you for providing a KIT version! Me encanta tu proyecto. Estaba buscando ideas para hacer algo igual y tu proyecto es perfecto la verdad. Pero tengo una duda. ¿La pieza con la que sujetas el disco de corte donde la has conseguido? ¿Te la has construido con un torno? Es que esa pieza es la única que no tengo claro como resolver. Asi es, la pieza que tu indicas fue torneada; no me imagino como poder fabricarla sin usar un torno. Tal como han indicado otros, la pieza clave de esta maquina es el eje y su montura, por lo que espero poder ofrecer esta pieza (y otras) dentro de un futuro proximo. Saludos!. Very Nice work and excited that there maybe plans for a kit to be released maybe in 2013. I’d love to be a distributor for it here in Australia mate! Felicitaciones desde Argentina por la estupenda mini-sierra de banco. Me interesa comprar un kit cuando salga a la venta. Mantenme informado. Saludos. I ran across your mini tablesaw searching for something exactly like this. Can you share your plans or can I offer you money for the plans? 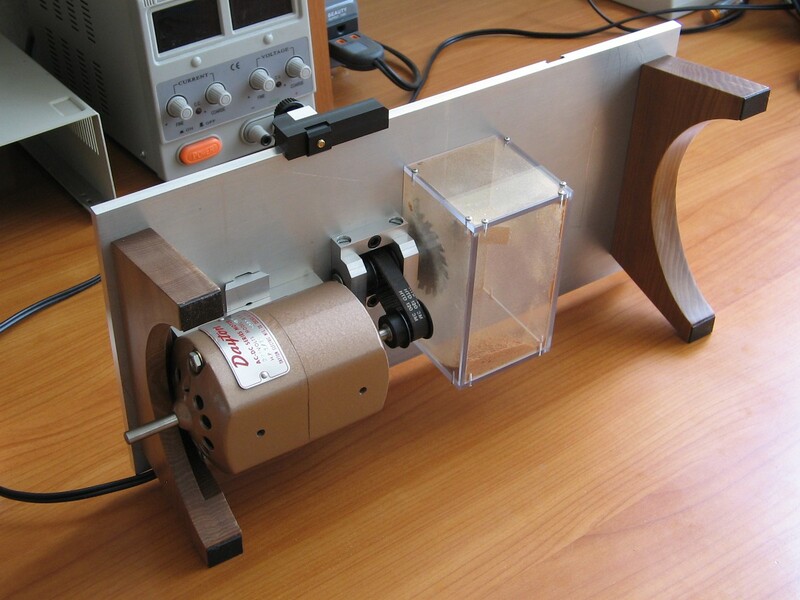 I am a penmaker and I need a tablesaw such as this to cut precision ends before turning. Gracias por tu interes. No se trata aun de un producto comercial, aunque espero que dentro de un mediano plazo lo sea. Wow! still thinking of a kit? I would take one for sure! I found your post via DailyRotation.com, congrats on making the headlines! Outstanding project; as a miniaturist I am always looking for tools like this. Will spread the word, and best of luck. Keep up the great work!! Great…Do you think on vending the full saw to the world? If so, please tell me the price. Thanks! If you build them, they will sell! I, for certain, would buy one. I can’t do one myself because I don’t have access to all the machinery required to work the parts, but I defintely would buy one. Great job! Congratulations on the implementaion and thanks for sharing. Te felicito, muchos piensan que no es posible contruir una sierra como esta con herramientas comunes. Te quedo muy bien. Gracias!. No tengo mas fotos disponibles pero en este plano estan todas las medidas del eje y su soporte. Si no tienes acceso a un torno/fresadora te recomiendo veas el proyecto de vallekanoOscar. ya veo que por el momento no lo estas comercializando, por si llegaras a animarte en un futuro me podrías mantener al tanto ya que me interesa mucho conseguir una de estas, otra de mis preguntas es ver que probabilidad si no es la sierra completa me pudieras conseguir los discos de corte y hacerme una cotización mi correo es este berick_mc79@hotmail.com esperare tu respuesta . El disco de corte de 2″ con insertos lo puedes encontrar en ebay, buscando por “PROXXON 28017”. Saludos!. Yes, that was the price back then, but as I say these motors aren’t available anymore. Anyway you should search for “sewing motor”; there are new ones starting at US30 and used for US15 even less (plus shipping). Or even better, check local sewing machine parts stores. 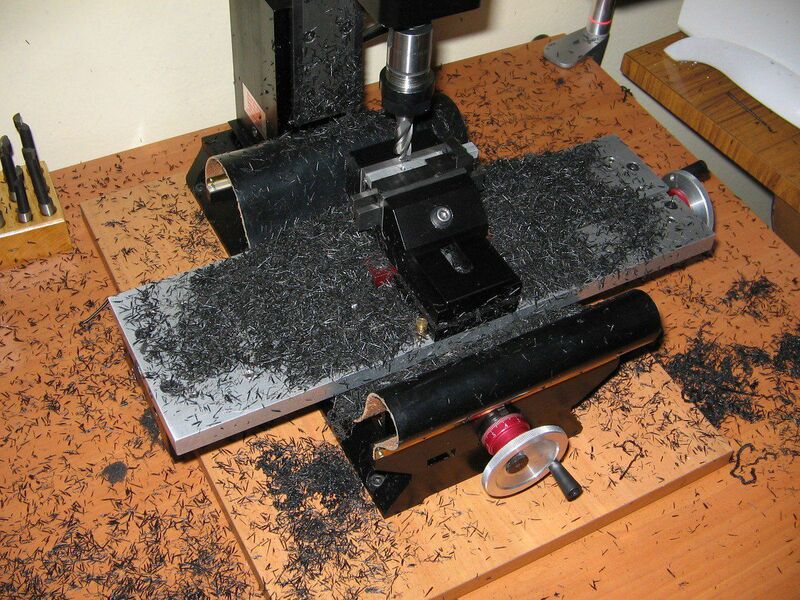 Did you start your business with this micro table saws? I have interest about one of them. Join. Did you start your business with this micro table saws? I have interest about one of them in Russia. Would look, and look how it works. When you can submit a complete set of parts for Assembly with motor 220 volt? Anyway – thanks for the marvelous creation. Great job! I have the Proxxon version and it isn’t that great. The fence isn’t square to the table and the table always seems slightly too small. Ok, I see 🙂 Well, I couldn’t find ANY on eBay… Would be such a nice project! The link for the autocad plans doesn’t seem to work. Any chance you could post a new link? I’d love to have such a great little table! A project to make some other projects! in buying one of these saws assembled. *Please* drop me an email when you can sell them! Dude, make the kit!! You’ll be a billionaire!!! Can this be made completely in wood? Will you be able to ship spares instead of the kit? Hi. I would like to sell key parts so anyone be able to add the simpler parts and build a full saw. Regarding using wood, I think all, excepting the spindle, can be made in wood. I hope to be anable to sell the parts soon; I need to finish my cnc right now. Nice job which naturally leads anyone to copy what you’ve done ! It seems to be the same motor as yours but the price !! Can you explain what kind of caracteristics your were looking for before you made up your mind ? Do you still have plan to sell kit? I live in a limited space (apartment) and this table saw would finally enable me to “make” something! I’ve been looking for those old Dremel mini table saw and still think yours is better. Estoy muy interesado en tu proyecto, ya que las sierras de estas caracteristicas son muy caras y no alcanza mi presupuesto. 1º Hay posibilidad de encontrar todas esas piezas por Ebay? 2º De existir la posibilidad, me podrias relacionar los proveedores para adquirir el material? 3º Existe la posibilidad de que tu vendas el Kit y asi montarlo particularmente? Francisco: las piezas no las encontraras en ebay, ya que la mayoria fueron fabricadas a la medida en torno y fresadora. Repecto a los proveedores de material, si te refieres a la materia prima (Acetal, aluminio en barras y planchas, etc), la mayoria los compre en ebay, aunque te recomiendo busques proveedores locales. Respecto al kit, mi intención es poder ofrecerlo dentro del segundo cuarto de este año. Hola, hace ya un tiempo te pregunte si tenias intencion de comercializar tu sierra, me gustaria saber si ya la comercializastes y si esta a disposicion de suministrarla y el precio de la misma. Asi mismo si puedes conseguir las piezas y mandarlas para montarla yo, me serviria de igual manera, indicandome el precio que tendria. Francisco: siempre ha sido mi intención el transformar este proyecto en un producto; sin embargo solo recientemente me he hecho del equipamiento, conocimientos y experiencias mínimos necesarios para fabricar productos “en serie” a un costo razonable (me ha tomado muuucho mas de lo esperado). Actualmente me encuentro en medio de la fabricación de un router cnc comercial de bajo costo, por lo que el tema del kit es algo que probablemente aborde el próximo año. I have a simple noob question about the software you are using for drawing the pieces. 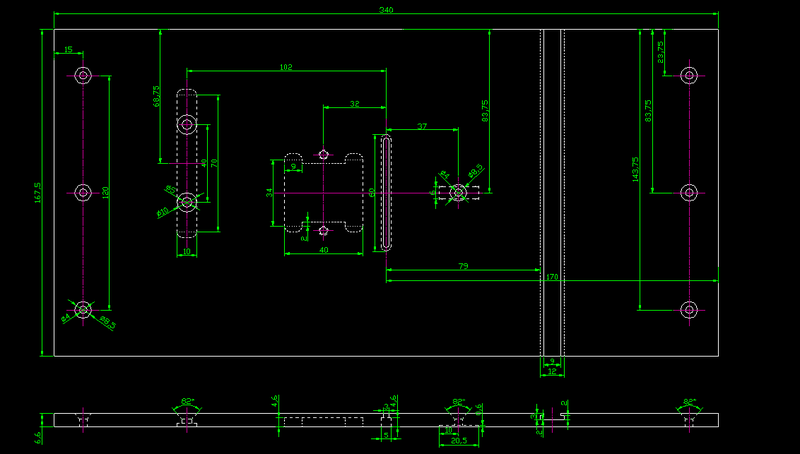 I asume it’s made with some Autodesk software, because the dwg extension. I’d very glad if you could tell me which program and version are you using? I looks what i need (maybe i’m wrong). El programa que utilice fue AutoCAD 2005. Saludos. Muchas gracias por contestarme, esperare a que hagas el kit, para podertelo comprar, me avisas cuando lo tengas? Ever thought of going into production… I bet you could make a tidy profit. If you do start making them what would be the selling price ? As I said I hope to sell this thing at some point in this Q2. Regarding the price, that would depend on the new design (how easy to produce it) and materials used. Very likely I will sell it without the motor (because of shipping costs). It’s a bit premature to state a selling price, but I think on price range of 100-200 US (without motor). Thanks for your interest. Sorry, there’s no kit at this time. I have a question: what type of motor should I use for a Proxxon FET project? I want it to be more powerfull than this one, but the design almost the same.The cutting capacity must be at least 15 mm (max 20 mm) for wood(pine,balsa). I’ll try to imitate your motor mounting system and some of the details.I hope it’ll be fine. Well, I’m not expert… FET table saw uses 80mm disk; mine uses 50mm, it means yo need 1.6 more power for the same torque at the cutting tip. Also you wish to double the cutting thick (I don’t remember very well, but I guess 10mmm was the limit for the power when cutting hard wood). So a simple calculation gives 1/15hp x 1.6 x 2 = 0.22hp = 164 watts, as a minimal; Proxxon uses a 200watt motor in his FET saw, wich makes sense to me. If you have money, the Sherline 1/3 HP DC Motor and Speed Control may be the perfect choice, I think. A cheap option would be a 24v 200watt scooter motor (around 50 us for the motor a 25 us for a speed controller on ebay), but a I have no experience with these motors. Good look. I’ll search for a cheaper solution.Thanks for advice! i’m from india. for the last one year i have been thinking about making a similar saw . i thought about several designs, but yours is by far the best. thanks for the post. you are a real pro!! Hi there, very impressive micro saw. I myself am building one and wanted to ask you if you manufacture your spindle where the timing pulley and blade rest on. Do you recommend me any website where I can buy these already made because I cannot manufacture myself. The carbide tipped proxxon blade is 50mm x 1.0 mm (10 mm bore). Can’t belive I forgot to add this information. Thanks!. It appears the link to the dwg file is broken again (takes you to a site to install myFlare). Any chance you can repost the file or send via PM? If you want to send as attachment I’ll provide my email address. I recently started taking a class in manual milling as a result of reading this post. Truly inspiring. I’m very excited to start building my own micro tablesaw. Hola amigo, me gustaria saber si ya sacastes el kit para la venta, Informame por favor. Felicitaciones por el diseño y lo sólida que es la mesa de sierra. quisiera saber si ya está a la venta, y si es así, donde se puede comprar. Repito las felicitaciones por este diseño tan sólido pequeño y potente. Looking on YT for some “small scroll saws” (like the proxxon) and saw your mini table saw video. So I decided to check your blog. Very nice work, great idea too! Quisiera informarme si ya sacastes el kit par poder montar tu sierra. This is the most awesome and beautiful home-made thingy I’ve seen in the world (besides home built power hacksaw). It’s so simple yet it’s so precise and handle the duty very well. Too bad metal work is not for everybody. I hope u sell the kit without the motor. What brand and type of mini lathe did you use to build this table saw? Parts were made on a Sherline lathe and a Sherline milll. Housings were cut on the mill and shaft on the lathe. You can check drawings for more details. Very congratulations on the excellent work! Thank you for sharing this project. I would reporduzir for me a table similar to yours. I’m having trouble finding a miter gauge like yours. Would you help me? Lo siento, no esta a la venta por el momento. MetalAddict, I can’t believe you haven’t come up with a kit or making the saw and selling them. Five years after you first posted, people are still wanting one, I would buy one, I am not a gear head nor metal hobbiest, so I am at a loss as to motors, pulleys, shafts, etc. Most hobbiest can’t afford a Byrnes but need a mini table saw. Well, I really, really would love to tackle this project; the truth is, I haven’t been able to invest the required time and resources. I started a small personal business (just me) about two years ago and I’ve learned in the hard way why having a production process for small quantities of a consumer product isn’t an attractive business; at least if you wish a quality product priced reasonably. It doesn’t mean it can’t be done, of course. 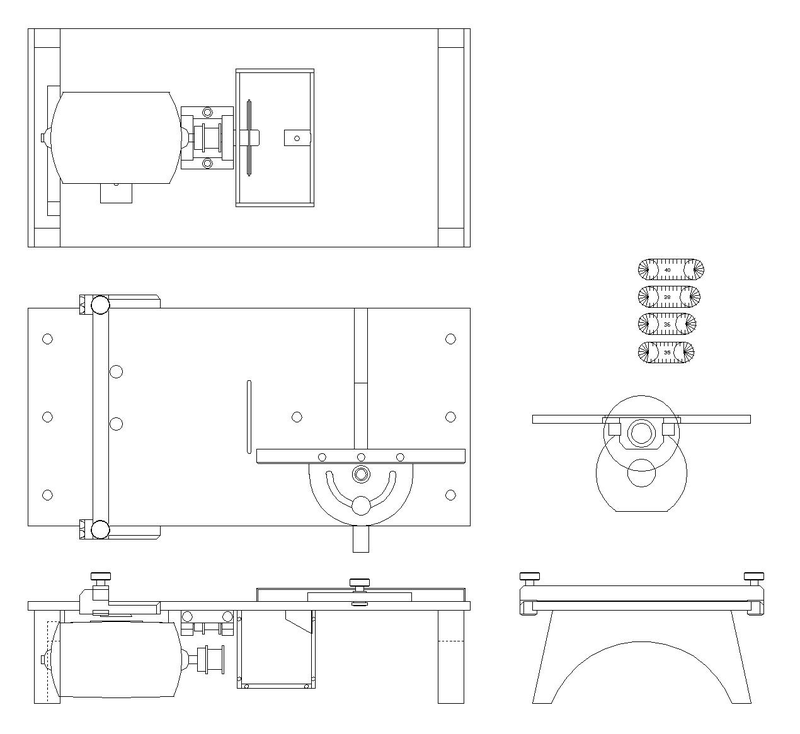 I think selling detailed plans is the way to go……No one is making a fortune selling model making mini saws because precision takes serious engineering and CNC manufactured parts. Just a serious electrical design and drive takes much more so it will be precise and still work 20 years later. Model enthusiasts tend to have dinner plate eyeballs and a mouses pocketbook that doesn’t create a market for a saw everyone expects to split human hairs six ways to Sunday. Maybe you’re right. This would require a different and more generic design, though. To be honest, one thing that discourages me from building the whole thing for others is the fact that even being a small machine, this is still very dangerous if used improperly, even with proper security mechanisms. Hola mi nombre es Gonzalo soy de Argentina, me interesa mucho tu proyecto, y me gustaría poder hacerlo, sin embargo no estoy consiguiendo el mini disco circular, si me podrías pasar el algún link de este producto, al menos si se consigue en ebay te agradecería un montón, acá en argentina no hay quien lo venda. felicitaciones por tu trabajo ! Saludos! Mis disculpas por esta respuesta extremadamente tardia pero he estado algo desconectado por un largo tiempo. La hoja de corte se consigue por ebay, buscando “proxxon carbide tipped wheel blade” (tienen varios diametros). Lo siento, este no es un producto comercial. Y muchas gracias por el apoyo!. Gostaria de adquirir uma unidade deste produto. Sorry this isn’t a commercial product. Firstly, what an inspiring micro table saw!! Congrats!! I have a two speed 170-220 watts little blender motor laying around here (220 volts) that I can use to make my own micro table saw too. The RPM in 170 watts is 17,000 and in 220 watts is 21,000. So the idea is to do a speed reduction of 3:1 so, respectively reducing to 5,667 and 7,000 rpm. I am thinking of using a 12 teeth pulley in the motor shaft (6.35mm bore) and a 36 teeth pulley in the saw blade shaft / spindle (8.00mm bore) with a 10mm wide belt. My question is: what is the difference of using 3mm or 5mm pitch? Any preference for the above mentioned setup? Would this motor handle a 85mm saw blade? Thanks in advance and your ideas and comments! Hello!. Sorry for this late reply. Well… your motor is about for times more powerfull than mine (mine is about 50w). And a 85mm blade is 1.75 larger than the 50mm proxxon I use. So my guess is that you should get more than twice cutting force with your setup (of course that’s a oversimplification). Good luck with your project!. Is the spindle and the piece to fix the saw with a screw one piece only? If yes, did you machine it? Do you think I can find one like this on eBay? 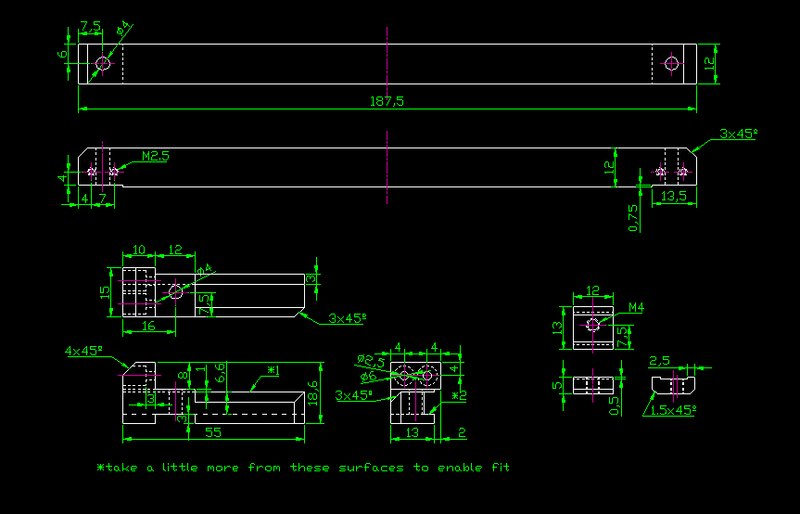 I plan to use an 8mm spindle instead of 6.35mm. I’m not sure if you can find those kind of parts on ebay. I machined mine on the lathe. You should have a design and then ask on a metalshop for making those parts (currently I’m not able to provide those kind of services). Can you make one for me? I want to purchase it. Thank you. Hi Ignacio ,i’m from indonesia and intrested about your project homemade microsaw table, Are you able to share your plans/drawings with me?